For all who find automatically generated maps monotonous, I am sharing a Simutrans version of the Isle of Man. Map size is 640 x 640. 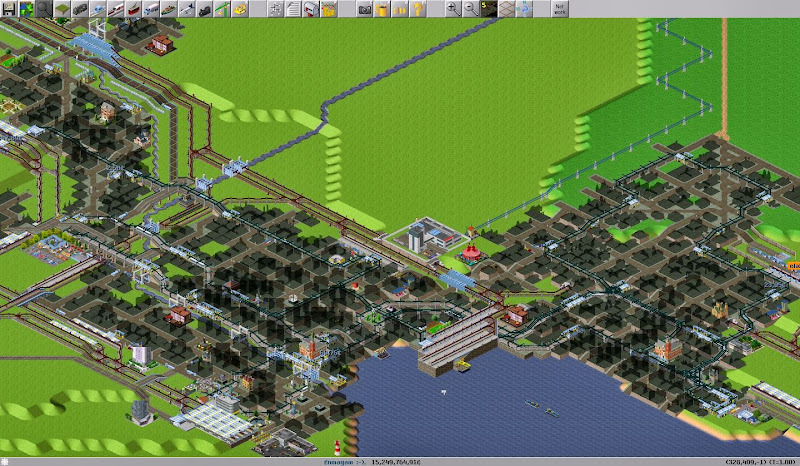 I have tried to correctly place notable settlements, rivers and main roads. I added some names for geographical features such as capes and peaks. 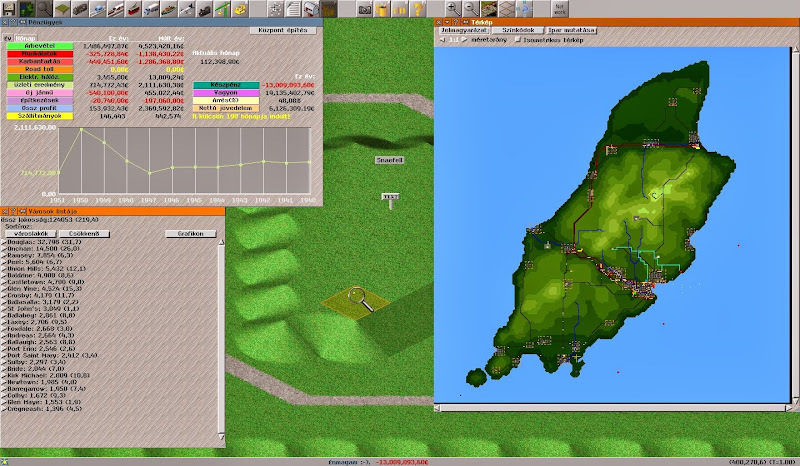 The in-game population approximates the population of real-life Isle of Man (around 85.000). 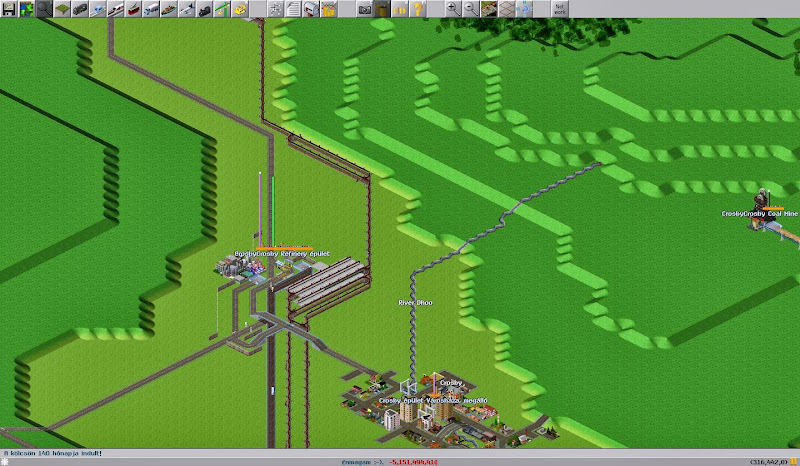 I added a rudimentary industrial network to increase playability, but the factories are not based on real-life. The scenario would be to design a clever transport network for this rather small island in order to allow for massive growth. Think Douglas the new Dubai. For an overview map click here. 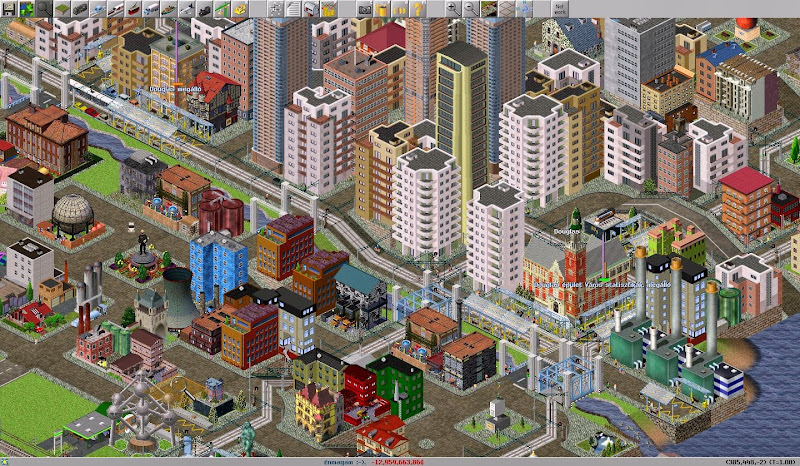 For a city list screenshot click here. For a sample view of Douglas and surroundings click here. Acknowledgment: I used a heightmap of the Isle of Map found here. Click here to download the save game. That is a nice source for heightmaps! Are they compatible with Simutrans heightmaps? And do you think it is allowed to publish them on the Simutrans maps website? Looks nice, I look forward to play it! I just can't seem to start it with timeline on; how to? @Combuijs: My guess is you'd have to contact the original authors and ask for permission? Or you can just post the link? Thanks to everyone who has downloaded the "scenario", I hope you are enjoying it! I like the map very much - small, but not too small. 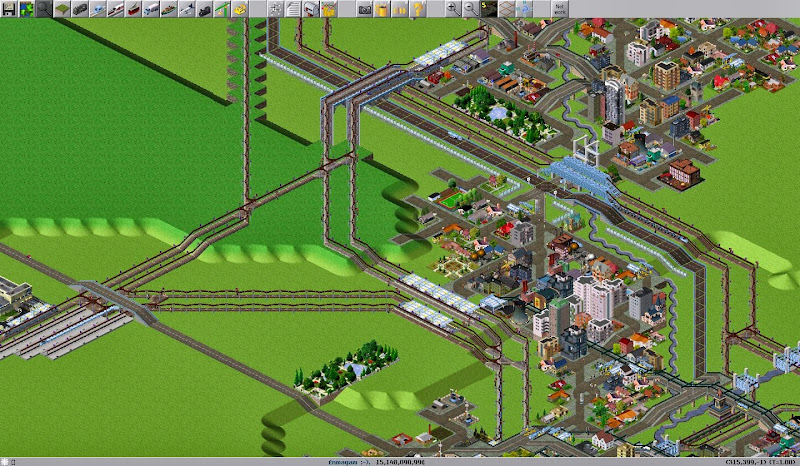 I'm having a profit of -16k monthly though, so I must be doing something wrong with all my trains... 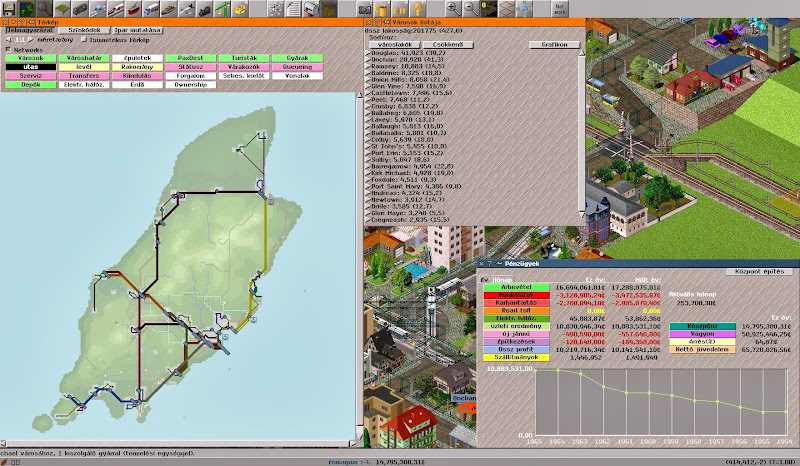 I connected almost every town with railway lines, but in the 30's the trains are a bit expensive to run - and buses are a bad choice. 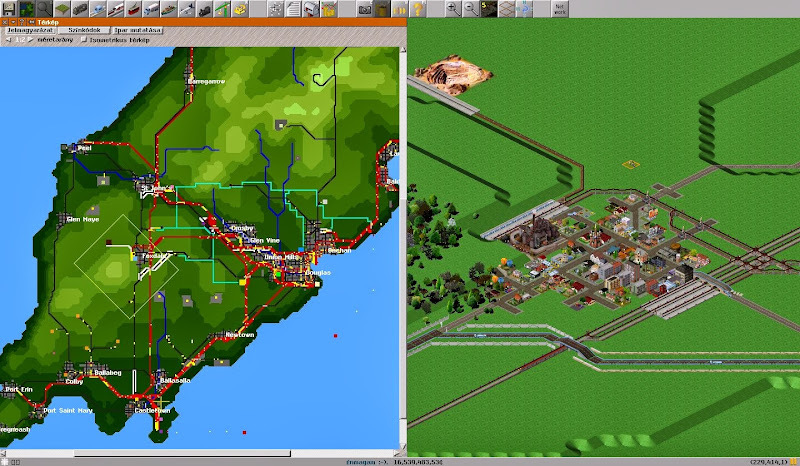 The rail line between Douglas and Ramsey via St. Johns is ready and making great profit. 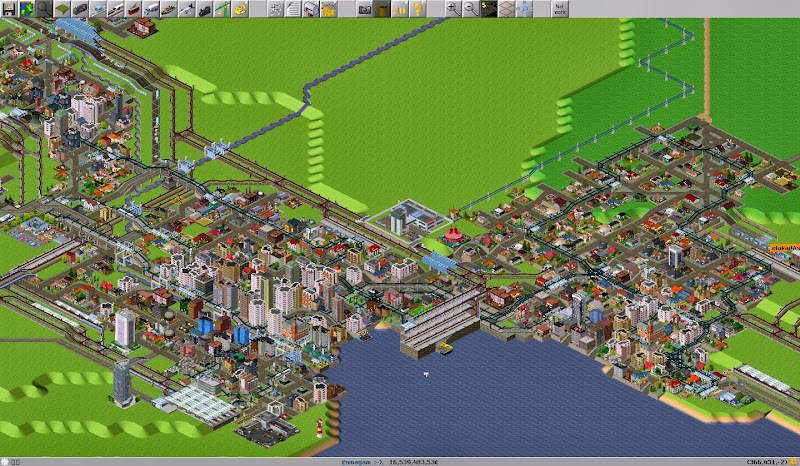 The douglas city bus network became a bit overcrovded, so i reorganized it to two tram lines and a bus line. All towns connected now. Next plans are improving the south, and adding a rail line between Ramsey and Onchan on the east shore to have a straight route between the two. and both go to the train station to south. HDomos, I can't help noticing in your 4th screenshot a few supertall towers (in blue and pink shades). I think that those building cam out japan. Correct, they are from the japan addons site... there are a lot of buildings there, some are quite nice but none are to the "official" pak128 scale so they look a bit out of place against other tall buildings that are to the right scale (like your apartment blocks, Fabio). 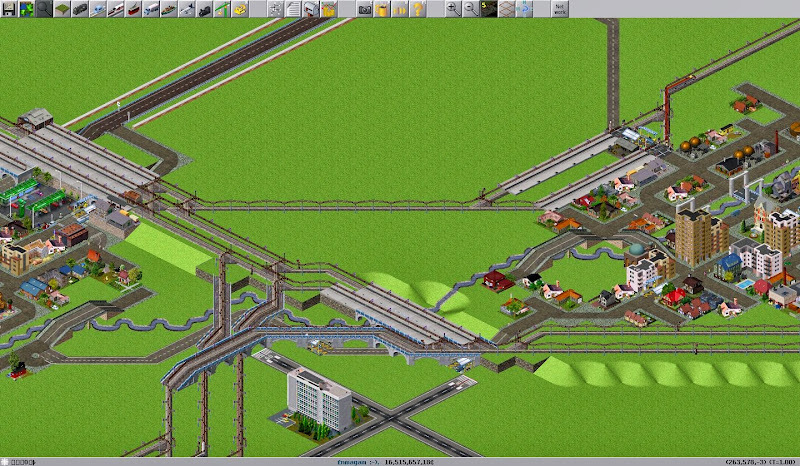 As there are many passenger trains, and the most of the freight is transported by train, the infrastructure is quite complex now. The main lines have two tracks, and both passenger and freight trains operate on them. Almost everything is electrified. There is a freight tunnel beneath the city of Onchan. Well, it has been a longer time since I have been playing this map (winter 2012). Here is a short story and a few screenshots of how I made it to 1945. 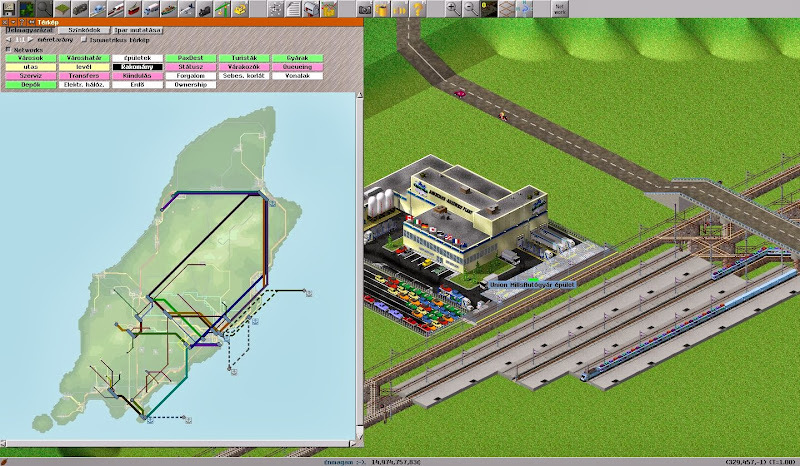 From the very beginning, works have started on a passenger network connecting Douglas, the largest island-city, and Onchan, its northern neighbour and second most populous city. No surprise then that the first rail was laid in the northern direction aiming at Ramsey, third biggest town. 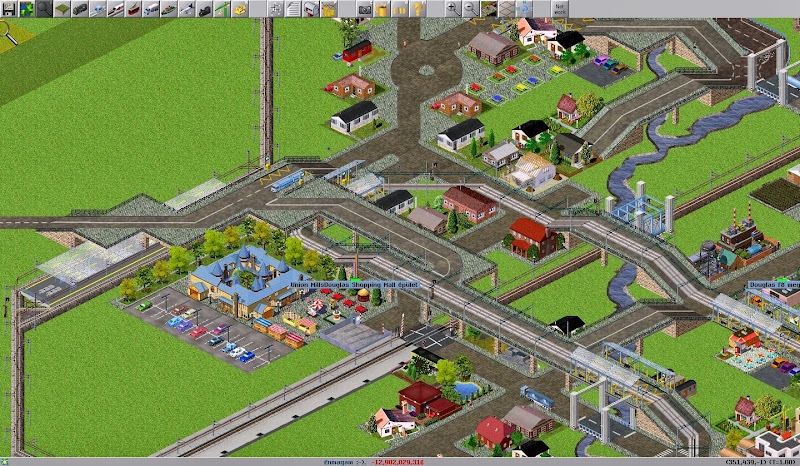 Due to a misscalculation in the financial department, the goal of completing the first railway (not doubletrack all the way long yet) was achieved a bit later than expected. Luckily it had proven a good investment and within a few months works have started on the central railway leading in the eastern direction from Douglas. This second railway was being extended once a few months always when the budget allowed doing so. Meanwhile, in order awake some transport in the desired area, express busses were always sent to link the next city, where the rail was about to be built. Within the first few years both connections were complete (reached both Ramsey and Peel) and running on doubletracks. 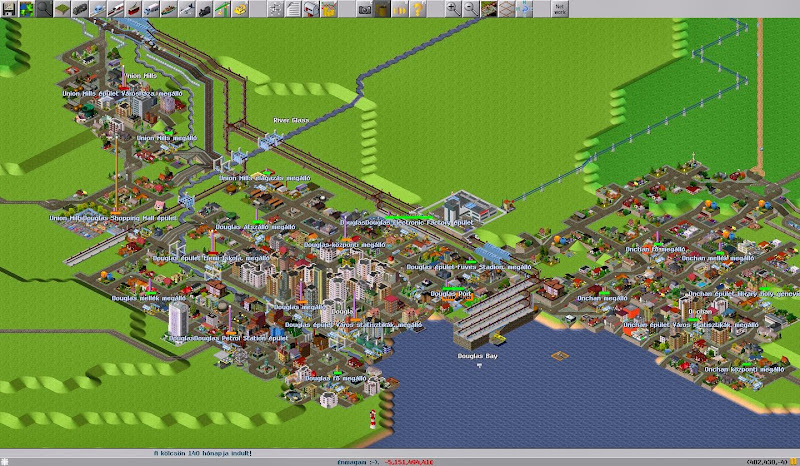 The amount of trains underway was rising rapidly as the demand was growing fast. After having estabilished the backbone of the public transport system, postal carriages were put into operation, since all the needed infrastructure was built already. 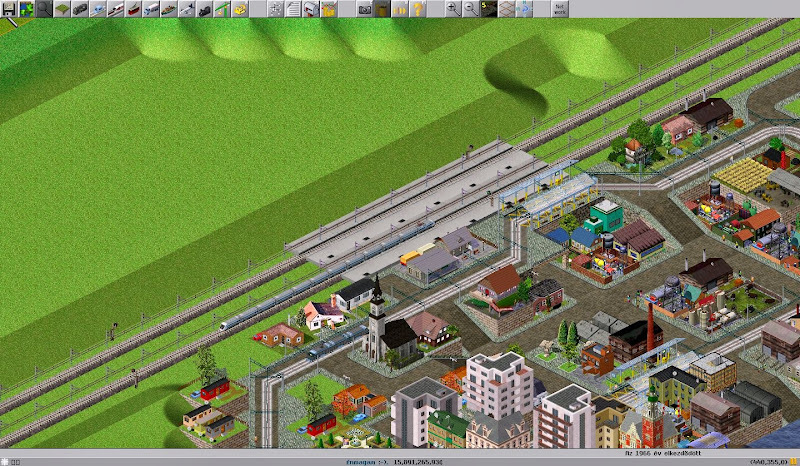 Having spare capacity on the railways built, the company had decided to step to goods-transportation bussiness. A few links were constructed to the existing railway and first carriages were dispatched in the northern and central area. 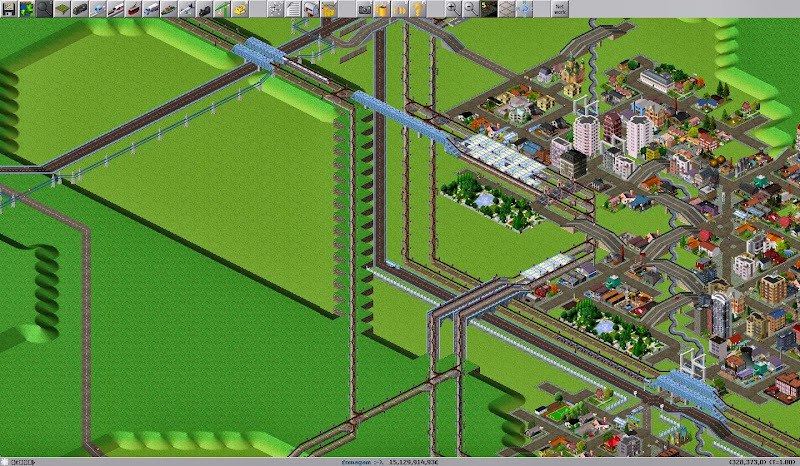 New rail connecitons to factories had been built in such pattern, that later they allowed extending the pax network to other destinations. That is how, step by step, stop by stop, the northern and later the southern pax lines were built. 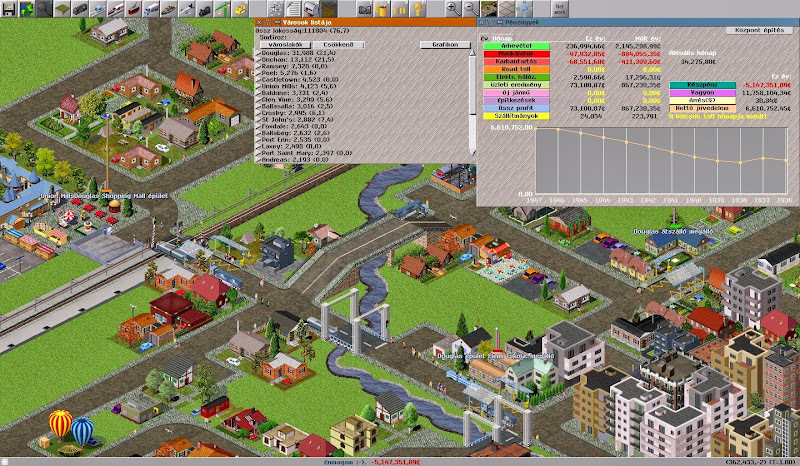 From that time on I was just looking at the speed by which the industries and cities were growing and trying to connect at least some of the chains, but they were much faster than me! 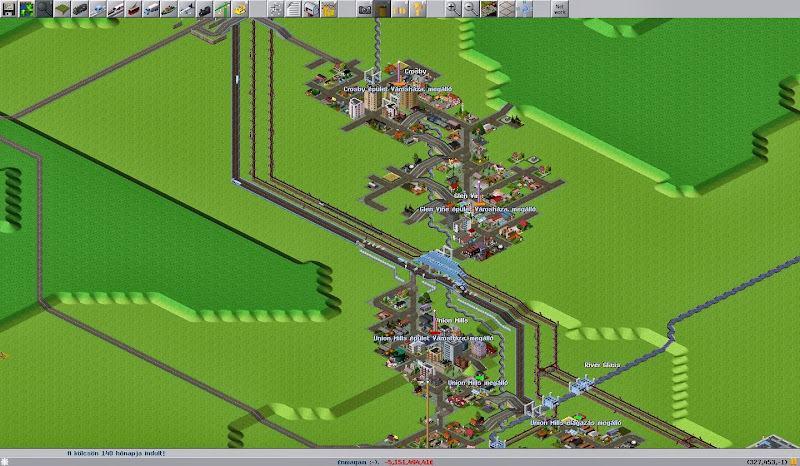 Pax/mail train network. Around 30 convoys consisting of Taurus + 2 mail carriages + 7 pax carriages. 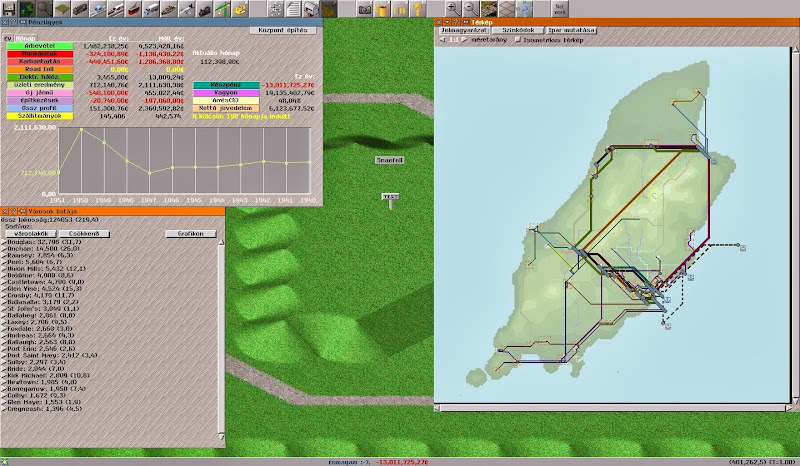 All the railways on the small island are built for 160 km/h. Taurus, used for all convoys, can reach 140, slowest of the goods trains 120, but due to the amount of pax stops it almost never causes any delays to pax trains on shared tracks. Douglas bay area. The two coastal cities are Douglas and Onchan. The first railway to Ramsey via Onchan was moved to a tunnel a few years ago, which allowed extending of the goods transport. The central pax/mail rail leads to the left upper corner. Left from Douglas, there is a joint terminus with the southern rail. The rest is goods rail, which will have to be expanded between Douglas and Peel, since large dealys threaten in there.As well, what seems to be a monolite urban area in 1945, used to be separated towns in the early 1930s. Complete network. 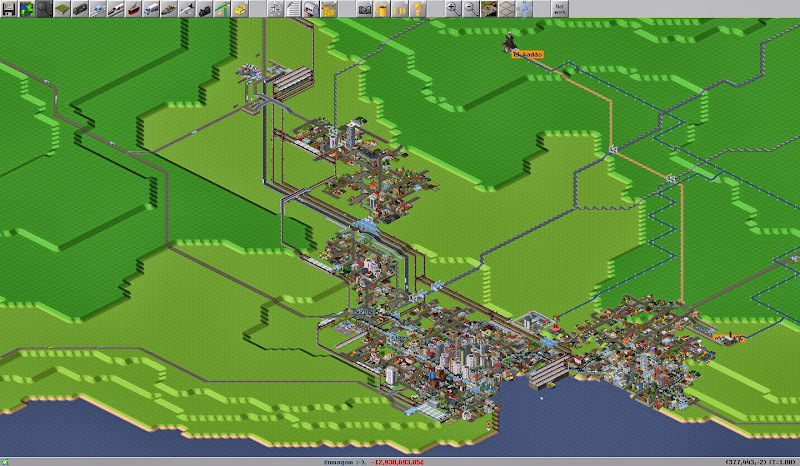 Population has approx doubled, amount of factories even trippled. Rumours are spreading, the company-owner is on a loooong holiday now.